In my limited-yet-growing experience of working with clients in a therapeutic setting, I find myself in the stage of trying different techniques and interventions from various theoretical orientations. While I do have a desire to work within a specific theory, my theory of choice would require a long-term therapy commitment. Given the pace of today’s society, my wager is the use of long-term therapy sessions (meaning a year or more) will fade as short-term sessions (8 weeks to 6+ months) emerge to the forefront of mental health treatment. This has already been happening for clients who rely on insurance plans for payment of services. Time is a precious commodity. Practicality has dictated I become familiar with theories designed for more immediate results. As an experiential learner I gain understanding through trial and error. While I do not recall the instance I am quite sure a simple “Don’t touch that! It’s hot!” was not enough warning from my parents to teach me as a toddler that fire is indeed, hot. Without a doubt I know I had to actually touch fire and feel the burn to learn that lesson. I can gain knowledge of something through oral instruction and reading on my own but to understand requires I experience the topic. So before I try a new technique with a client, I try it out on myself first. Not only do I gain an understanding of the technique or intervention, I also gain self-awareness. Recently I took a closer look at the wheel of wellness model. The Substance Abuse and Mental Health Services Administration (SAMHSA) has a wellness initiative called the Eight Dimensions of Wellness which provides an excellent example of the model. EMOTIONAL – Coping effectively with life and creating satisfying relationships. SOCIAL – Developing a sense of connection, belonging, and a well-developed support system. SPIRITUAL – Expanding our sense of purpose and meaning in life. OCCUPATIONAL – Personal satisfaction and enrichment derived from one’s work. PHYSICAL – Recognizing the need for physical activity, diet, sleep, and nutrition. INTELLECTUAL – Recognizing creative abilities and finding ways to expand knowledge and skills. ENVIRONMENTAL – Good health by occupying pleasant, stimulating environments that support well-being. Working through the dimensions on myself I found a couple of areas in need of improvement. Specifically the physical and spiritual dimensions. Physically I can attribute the need for improvement to the current season. It has been a strange winter where I live. As the temperature warms, I will be more inclined to go outside and be more active. More activity leads to better nutrition (more or less) and recuperative sleep. I cannot use the temperature outside as an excuse for my physical inactivity. There will be more winters in my future and I’m not getting any younger. Additionally I am pursuing a career in a field that is sedentary in nature – sitting and talking. Definitely need to fill this gap. The spirituality dimension review revealed a lapse in my own practice of connecting with the Divine. In the grand scheme of things, gaining awareness of where improvements can be made in my life could have been the whole reason for researching this particular technique in the first place. A Universal plan working to perfection to get me to look at my own dimensions of wellness, if you will. Working through the dimensions has been a great tool in my own self-awareness and allows me an understanding in using the model with clients. It also serves as a reminder of the importance of self-care. Thank you for your comment! 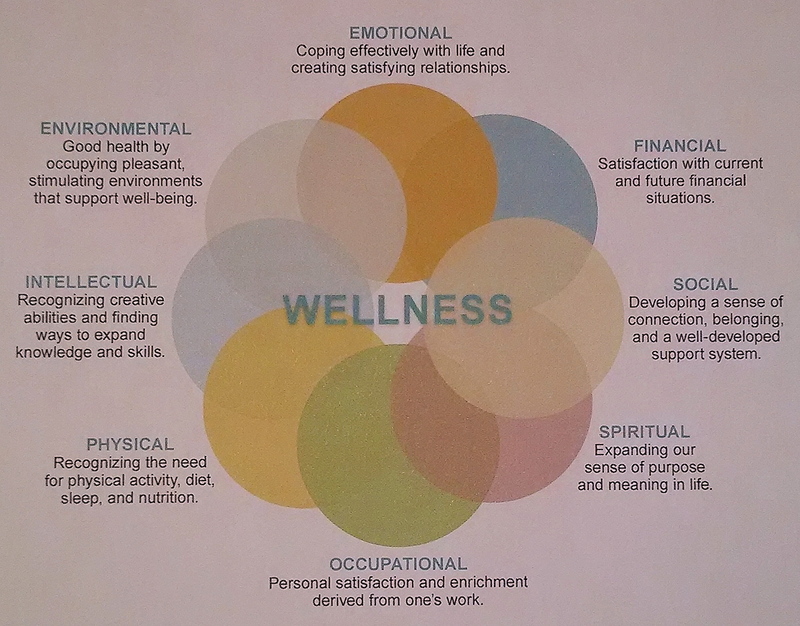 The photo is a snapshot of SAMHSA’s free downloadable poster retrieved from here: http://store.samhsa.gov/product/SAMHSA-s-Wellness-Initiative-Eight-Dimensions-of-Wellness/SMA12-4568.